For the interior offices of The Sentinel set, Pierre Steele photographed the film’s location in Century City to create the day and night photo backings. Using backings, allowed the art department and the Director of Photography to have more control over the final image. On the other hand when a production uses green screen, the Visual Effects Department controls the final product, which is ultimately determined months after principal photography has been completed. Cinematographers and Production Designers need to know what they’re lighting for in order to design the lighting scheme. Light contamination can be a major challenge when using green screen, even when everything is calibrated and evenly lit. Backings, on the other hand, do not suffer from the same light contamination issues. The basic principles of art direction—scale, proportion and perspective—don’t change because a film is displayed in 3D. When The Green Hornet started shooting, no one knew it would finish as a 3D production. The backings were planned as separate elements, giving the Director and Director of Photography flexibility to shoot the film as desired. “The decision to convert to 3D in post didn’t impact the decision to use backings and they performed exactly as needed—and as expected. However, working in 3D requires keeping an eye out for every opportunity to create visual depth, had we known that the film would ultimately be viewed in 3D, I would have generated discussions between JC and our Cinematographer to make sure we were taking full advantage of the backings created for the Sentinel Office set," said Greg Papalia. A key scene takes place in the three-story tall LA Times print press building, a portion of which was built on a stage. The production design team had a choice: spend a lot of money to build the room’s walls on stage or save money by scenically painting the walls on muslin and hanging the painted backings on the set. 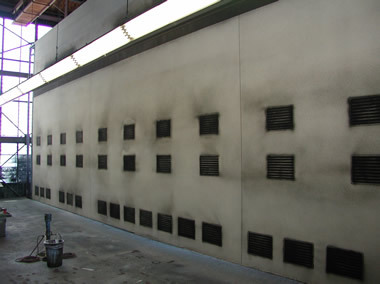 “The image was dirty walls with huge vents, so JC Backings custom painted one 90’ x 36’ backing and one 70’ x 36’ backing to match to the location’s real walls for about 10% of the cost to build them, this also gave us the advantage of easily and quickly tracking the walls out of the way for camera access” said Papalia. When using green screen, productions often have to pay for visual effects to create the view from every window, which can become very expensive. For The Green Hornet, the sheer amount of windows in the Sentinel office set made backings the more cost-effective option. The Green Hornet project is another example of why JC Backings is the preferred choice of more production, art and design professionals. You’ll get an insider’s view on what’s going on at JC Backings, including Pierre’s recent location shoots, videos, news and other interesting posts. Next time you’re on Facebook, be sure to ‘Like’ JC Backings. JC Backings specializes in oversize backings as well as creating custom backings to virtually any specification. Our highly trained personnel create painted, photo and digital print backings for feature films, television, commercials, theme parks, music videos and much more. We offer the industry one of the largest selections of painted, photo and digital print backing inventories, with more than 5,000 rental backings available including historic stock from MGM, 20th Century Fox, Universal Studios and Walt Disney Studios. 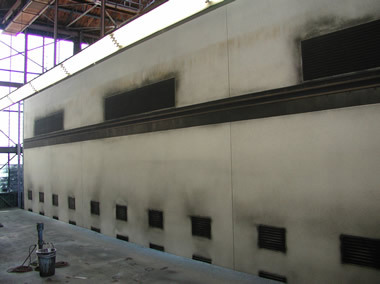 Our backings also meet or exceed industry standard flame proofing requirements.